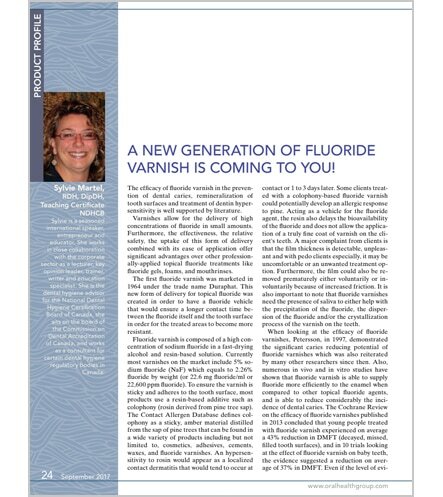 FluoriMax’s patented technology is the first varnish to be colophony-free. Colophony is the resin component of traditional varnishes that originates in pine trees. 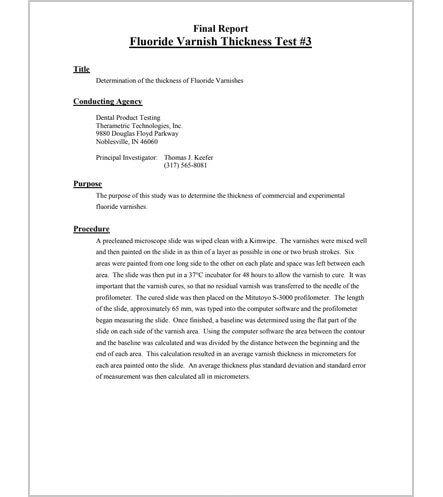 Since there is no water in varnishes, fluoride needs to escape the varnish and contact the saliva before it is activated. FluoriMax’s 2.5% sodium fluoride reaches water more efficiently because it uses dewaxed, food-grade shellac, a resin that dries and becomes 7 times thinner than other colophonies, allowing a higher quantity of fluoride to be released and in contact with the tooth. 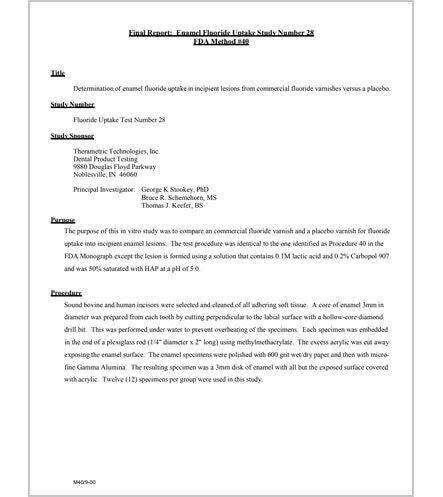 More sodium fluoride touching saliva means more of it is released rather than brushed off with the resin or swallowed in small pieces before it can be released from the colophony. Shellac, propylene glycol, ethyl alcohol, dibasic sodium phosphate, ammonium phosphate, xylitol, sucralose, calcium hydroxyapatite, mint flavour or bubble gum flavor. Application 1. A prophylaxis is not required, however, removal of excessive plaque or calculus may be beneficial. 2. Prior to application, shake the bottle vigorously for 15 seconds. 3. Hold the bottle upright and flip open the dropper cap. 5. Leave the tooth moist, but immediately before application have the patient swallow or use suction to remove any excess saliva. 6. Dip the applicator brush into the dappen dish; remove excess. 7. 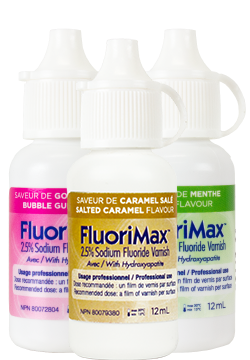 FluoriMax is a thin liquid that dries and adheres completely in seconds. Sitting the patient upright during application, while not required, reduces the potential for it to drip off of the tooth before drying. 8. Start on the lower posterior teeth and apply one continuous layer of varnish by sweeping the brush across the facial/buccal surface(s). NOTE: This motion will provide complete tooth coverage since the varnish flows and adheres beyond the brush width. One coating is all that is needed per surface. If you see white streaks or if your patient feels a strong flavor taste after the application, you have over applied. Do not exceed the recommended dose. 9. FluoriMax dries rapidly. Keep the cheek and lips off the tooth surface for 3 to 5 seconds after application to allow it to completely harden. Patient instructions For optimal results, ask the patients to avoid drinking alcohol and brushing or flossing during 4 hours. 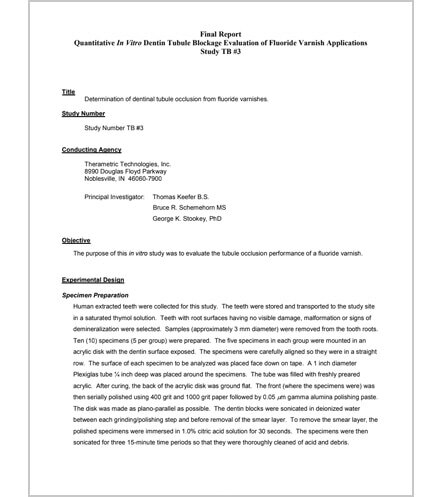 Other fluoride preparations should not be administered the same day of application and use of fluoride supplements should be discontinued for several days after the application. This is such a great product. Patients don't have to leave the office with a sticky feeling on their teeth and no clumps either! It's fast to use, applies much thinner than other varnishes, and dries clear. Better fluoride uptake & improved patient compliance too! Revolutionary! All my hygienists love this product.